One of my favorite kinds of arcade games are single screen maze games where you either have to run from things or chase things. Examples would include Pac-Man and Bubble Bobble. So I was happy to find out that retro styled Robbotto plays like those titles. 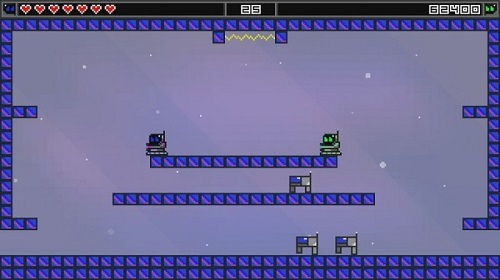 In this game, you are a robot and must deactivate all the enemy robots in a room. To do this, first you must zap them with a bolt of electricity, and while they are still electrified, you must spray them with water to stop them. Robbotto is available to download on Switch and PC, but reviewed on Switch here. Each level is a single screen, and enemy robots walk about. Some can jump, while others can shoot. Be careful not to touch them or their projectiles, or you’ll lose a life. Even when robots are shocked, you mustn’t touch them until they’ve been thoroughly doused with water. If you lose all of your lives, it’s Game Over. Depending on the level of difficulty that you choose, you can start right back at the stage you left on. Once you defeat all robots, you can collect little glowing squares from them for points, and then head for the exit portal. There are bosses to fight every so often, too. Like any good arcade game of this ilk, there is a two player co-op mode as well. The interesting thing about this mode is that one player can shoot electricity, and the other sprays water. So you really have to use teamwork! Unfortunately the game isn’t near as good as classics it’s trying to imitate, like Bubble Bobble. Movements, especially jumping, feels a bit sluggish, and the game is lacking any sort of charm. All the enemies look nearly the same, backgrounds are plain and music is forgettable. Sometimes character and charm can go a long way. The only violence in this game are robots zapping each other with electricity and water, and causing them to short out and stop working. Reading skill is helpful for some of the menu text, but not necessary just to play. I loved playing Bubble Bobble with my brothers when they were younger, so little kids might like this game as well. Robbotto is rated E for Everyone.